The Silver Muse bars and nightlife cater for almost any mood. There is everything from cabaret to full-scale production shows, as well as intimate venues for romantic nightcaps. We cover them all in our luxury cruise review of Silver Muse. The Panorama Lounge is an iconic Silversea bar. On Silver Muse it is perched high at the back of the ship with uninterrupted 180-degree wake views. This makes it the perfect place to relax, especially on sea days. The Panorama Lounge terrace feels like it belongs on a private yacht. 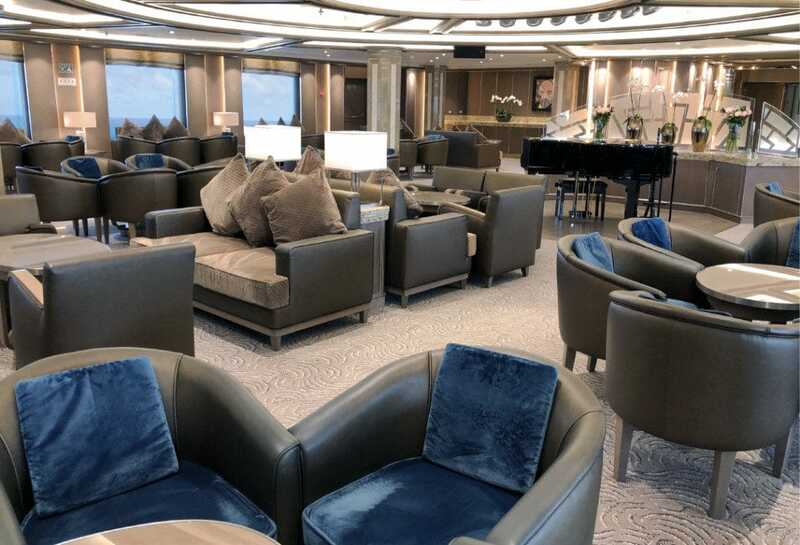 What makes the Panorama Lounge on Silver Muse extra special is the terrace. It has comfortable blue and white furniture and pot plants as well. It feels like a private yacht. The Panorama Lounge also serves high tea each afternoon. In the early evening the Silversea Trio plays and there are canapés, cocktails, and Champagne. In fact it’s one of the most popular Silver Muse bars to watch the sunset. The Panorama Lounge on Silver Muse opens at 10:00am. The Silver Muse nightclub starts once the evening show has finished in The Venetian Lounge – usually around 11:00pm. The Silver Muse nightclub is located in the Panorama Lounge. There is a dance floor as well as club lighting and a D.J. who spins disco classics and top 10 hits. The popularity of the nightclub seems to depend on the next day’s port of call. Indeed the nightclub is busiest when Silver Muse is going to be at sea. Although the Silver Muse nightclub officially stays open until late, things usually wind down by about 1:00am. Tor’s Observation Library is one of the best-kept secrets on Silver Muse. It is located right at the front of the ship and has commanding 180-degree views. It is a serene place during the day – ideal for watching the ocean drift by with a good book. Tor’s Observation Library is the perfect place for sunset libations. In the evening Tor’s Observation Library is quite different. The bar opens as the first golden rays of sunset fill the room. Soft music sets the mood and guest come together to talk about their adventures. It is one of the best Silver Muse bars. Bar service commences at 6:00pm with Champagne and perfectly made cocktails. The attentive staff glide past with plates of delectable canapés. It’s the perfect way to unwind before another great meal onboard. Tor’s Observation Library is open all day, however the bar hours are 6:00pm to 11:00pm. It’s one of my favourite Silver Muse bars. The theatre on Silver Muse is The Venetian Lounge. It is a single-level, pillarless auditorium and everyone has an unobstructed view. The Venetian Lounge is where guest lecturers present their enrichment programs. It is also where the cast of six onboard singers known as the Voices of Silversea perform their shows. There will usually be at least three full-cast shows every 7 days. A company based in New York produce these for Silversea. One of the cast shows is called “Argento” – which is Italian for “silver”. It is a swing show that charts the music of the 1930s, albeit with a modern twist. The cast sing and dance both as a group and individually. In general I can’t help feeling these cast shows are not quite as creative as they could be. Dare I say it, they seemed somewhat cliched at times. Thankfully the singers also perform their own shows on Silver Muse. It’s here where they really shine. They play to their strengths as artists and express their innate creativity. These were the most memorable and positively commented on shows during my voyage. Showtime on Silver Muse is usually 10:00pm, however on the evening before disembarkation it will be at 6:15pm. In addition to live performances, The Venetian Lounge also shows new-release and classic feature films. These will be advertised in the daily Chronicles newsletter. Dolce Vita is the main bar on Silver Muse. The bartenders mix great cocktails and there is live music each evening. Pre-dinner canapés are also served and there are after dinner tipples too. The main Silver Muse bar is called Dolce Vita. However, the Dolce Vita bar on Silver Muse is very different from its namesakes on the smaller Silversea cruise ships. It occupies a huge midship space. In fact it is the largest of the Silver Muse bars. Also the Dolce Vita bar is combined with the reception and tours desk areas. See the Dolce Vita bar on Silver Whisper. Because of this the bar tends to become a thoroughfare to and from reception. Its size and brightness also detract from the ambiance. It can feel a little like an airport lounge at times. That said, Dolce Vita has some cozy corners and there are lots of sofas for relaxing with your favourite libation. Dolce Vita is open daily from 2:00pm until late. The Connoisseur’s Corner on Silver Muse is the place to indulge in premium spirits and cigars. It is a small lounge lined with dark wood cabinets displaying a range of cigars. 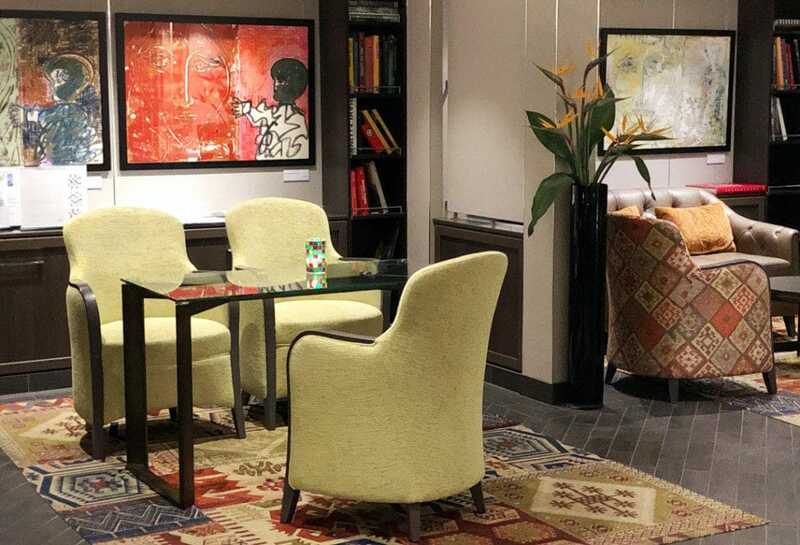 There are deep Chesterfield-style arm chairs and quirky pieces or art hang from the walls. In addition there is a smoking area on the terrace outside the Connoisseur’s Corner. It’s a nice place to relax with high back whicker-style armchairs. The Connoisseur’s Corner is open from 9:00pm. The Arts Cafe is like a quirky New York-style coffee house. There are dark timber floorboards and Persian carpets as well as comfortable arm chairs and sofas. Fine modern artwork hangs from the walls and there are fascinating pieces of sculpture. Plus, it’s bursting with books covering all aspects of the arts, from Prada to Picasso. The arts cafe has great coffee and tempting snacks to enjoy while you relax with friends. The Arts Cafe has a terrific atmosphere, in fact it’s one of the most popular venues on Silver Muse! What makes it even better is the coffee. In fact the Arts Cafe is a coffee aficionado’s delight. From espresso to cappuccino it’s all brewed to perfection. A range of artisan teas are also available too. The Arts Cafe offers a tasty array of snacks throughout the day. I especially liked the variety of salads including Carrot Salad, Sweet Potato & Tangerine Salad and Octopus Salad. There are also small cheese plates as well as sandwiches and sweet treats. In addition the Arts Cafe have a selection of infused water, like Detox Citrus Water, Detox Lemongrass & Ginger Water and Detox Cucumber Water. They all have a refreshing zing! The Arts Cafe is open from 6:30am until 11:00pm daily. One of the most atmospheric of the Silver Muse bars can be found in the Atlantide restaurant. Simply called the Atlantide Bar, it feels like it belongs in a private club. There is a long black granite bar where you can sit and watch your favourite libation being made. The Atlantide Bar is the perfect place to recount the stories of your day over a pre-dinner drink. The Atlantide Bar is open from 6:00pm. Read the wellness section of our Silver Muse review by clicking the button below.